Thomas Cooper was born on October 22, 1759 in London. He attended University College, Oxford, and though he failed to obtain a degree he was learned in science, medicine, and law. After work at the Inner Temple, he became a barrister in 1787. In England, he was a lawyer, scientist, and philosopher. Though acquainted with men like William Pitt and Edmund Burke, his radical views were not well received at the time. An eventful four month visit to Paris, including an address to leading Jacobins in April 1792, did not aid his reputation (even though he and his companion, James Watt, had to flee the country for their lives after standing up to Robespierre in public arguments). He was condemned on his return to England; his admission into the Royal Society, after his friend Joseph Priestley had nominated him, was rejected. He first visited the United States in 1793 for a few months and returned with the remainder of his family the following year. Along with his friend Priestley, himself seeking quieter surroundings, Cooper settled in Northumberland, Pennsylvania. He became a United States citizen in 1795 and was admitted to the Northumberland Bar. But Cooper's radical philosophical and political views were not met with a warm reception in America, either. As a friend of Jefferson and an enthusiastic anti-Federalist, he criticized the Sedition Act, passed under John Adams' administration, in the Northumberland Gazette, which he edited. This criticism led to Cooper being brought to trial in April 1800 under that very act. He was convicted, sentenced and served six months in prison. Upon his release, Cooper was elected the president judge for the district in the area of Northumberland in 1804. His radicalism, combined with his exacting and rigorous procedures, eventually alienated even his strongest supporters and he was removed from the bench in April 1811. After this, the diminutive Cooper -- barely over five feet tall -- turned his energetic mind to the academic path he would follow for the rest of his days. On August 7, 1811, Cooper assumed the position of the chair of natural philosophy and chemistry at Dickinson College, after having been unanimously elected by the college trustees. Cooper's religious beliefs -- he was a Deist -- were bound to cause friction with then President of the College Jeremiah Atwater. Atwater, a conservative Presbyterian clergyman, mistrusted Cooper from the start and watched for any act of Cooper's that would corrupt the young men of the College. The rivalry between the two eventually embroiled the entire institution. By 1814, Cooper had organized faculty members against the President and issued his own stinging denunciation of Atwater. In 1815, Cooper resigned his position in favor, he stated emphatically, of a better paying situation elsewhere. 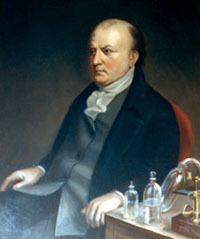 After his time at Dickinson, he served as a professor of applied chemistry and mineralogy at the University of Pennsylvania from 1816 to 1819. In 1819 he was, through the influence of Thomas Jefferson, elected to the faculty of the newly founded University of Virginia in Charlottesville. Cooper never did assume this position but instead became professor of chemistry at South Carolina College in 1820. He was elected as the College's second president in 1821 and remained in that post until his retirement in 1834. He continued to be active in political circles at the state and federal level until his death. Cooper had married Alice Greenwood in England and they are known to have had at least four children, sons Charles and John and daughters Eliza and Eleanor, all of whom accompanied him to America. Cooper died on May 11, 1839 and was buried in South Carolina at the Trinity Churchyard in Columbia. Researched, authored, and edited by John Osborne, Ph. D., and James Gerencser.